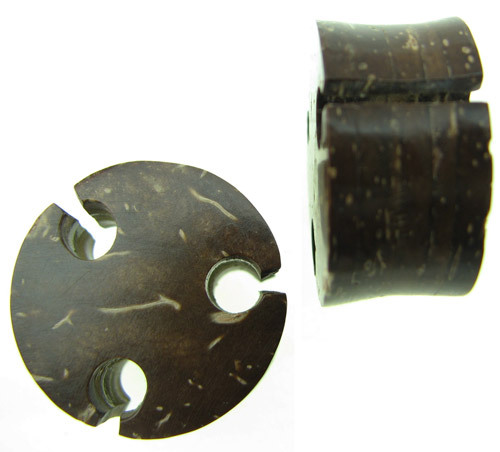 These large gauge double flared saddle plugs with drilled holes were hand carved in Indonesia from natural coconut shell. These organic flesh plugs were not mass-manufactured, so some variation (such as color, texture, etc.) is present from piece to piece in a pair and also from the pair shown in this photo. Approximate length from front to back: 3/8" for the smaller gauge sizes, and 9/16" for the larger inch sizes. 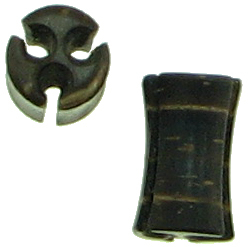 Coconut shell lobe plugs normally available in sizes 4 gauge up through 1 inch diameter. Other gauge or inch sizes may be available, Contact Us for more information. 4 gauge 2 gauge 1/2 inch 5/8 inch (+$4.00) 3/4 inch (+$4.00) 7/8 inch (+$4.00) 1 inch (+$4.00) Select your gauge or inch size and click "Add to Cart".